Planning a South Africa vacation? Discover traditional secrets and the bond between the terroir and tipple. It’s a New Year so knock back our favorite exclusive wine experiences on your South Africa tour! Rustic wine trams, luxurious wine cruises and “vinotherapy” are here to tempt and tantalize. 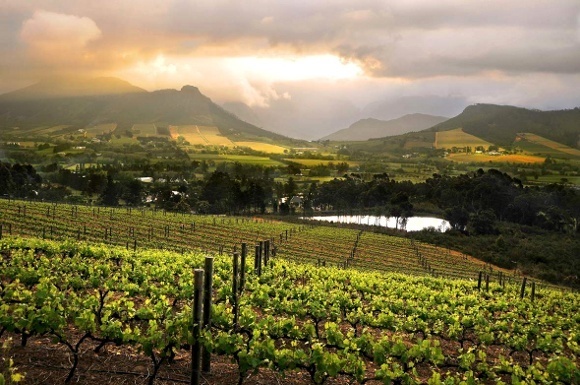 The history of the wine industry in South Africa stems back to the 1700s when the Dutch colonialist Jan van Riebeeck produced wines from the stunningly beautiful and fertile mountains valleys around Cape Town, the city he founded. 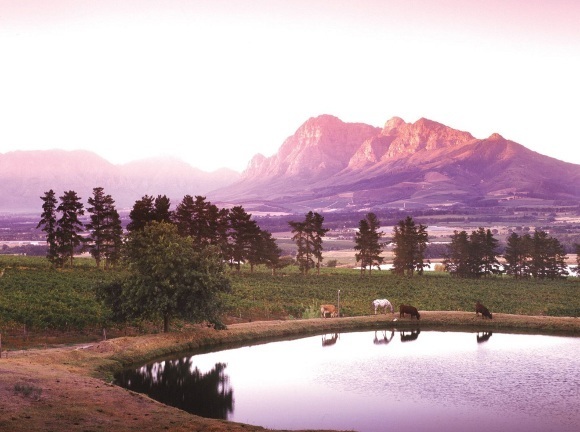 Experience the Cape Grapes for yourself with these classic wine routes and our insider tips. One of the oldest wine-making regions in South Africa, Constantia boasts vineyards that create some of the world’s greatest wines. 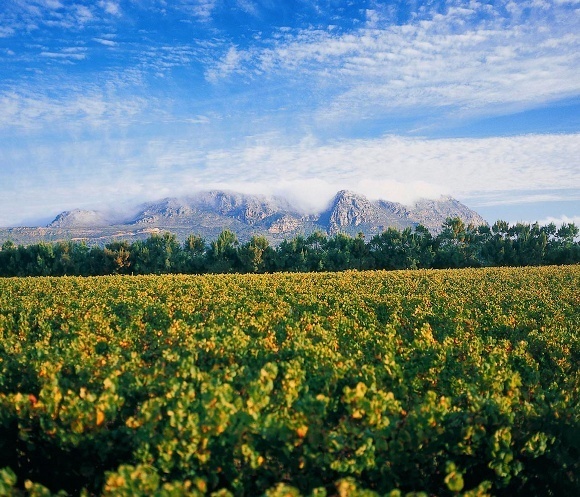 Just fifteen minutes from Cape Town’s center and with perfect vine-growing conditions, the eight wine-making farms along this wine route continually receive major awards. Cellars-Hohenot, which has some of the most gorgeous panoramic views within the Cape Town Winelands. Or try The Steenberg Hotel on Steenberg Estate which has been lovingly restored and is not only an elegant place to rest your head but is considered a National Monument, and has incredible vineyards and views over False Bay. When you’re not sampling the award winning wines or having a gastronomical feast at Catharina’s Restaurant that’s housed in the original winery, you can tee off on a championship 18 hole golf course. The annual Constantia Valley Grape Run, a challenging 21.1 kilometer run through the incredible wine farms of Groot Constantia, Klein Constantia and Buitenverwachting. The second oldest town in South Africa, Stellenbosch holds firmly onto its European routes but has a youthful vitality as a renowned university town. Amble through the perfectly oak-lined avenues with their historic stately homes and mansions. On the outskirts lies Summerwood Guest House, brimming with traditional charm, spectacular gardens and nestled within the mountains and rivers, this is a perfect launch pad for your private wine tour. Savor the local nougat and wine or explore the local vineyard hiking trails. There is also an increasing focus on wellness centers in Stellenbosch, which offer vinotherapy spa treatments so that grapes can assist in rejuvenating and detoxifying the body. The Stellenbosch Wine Festival, an annual highlight that blesses the harvest and fuses together culture and art for the connoisseur and casual wine fan alike. Translated as French Quarter, Franschhoek is one of the Winelands prettiest towns and is considered the heartland for gastronomic and sommelier encounters in South Africa today. La Petite Ferme for some of the most incredible views in a boutique and artisanal winery that boasts wonderful vineyards and intimate cellar tours. Try Klein Oliphants Hoek for a stay in an early 1900s renovated missionary station that boasts timeless chic with its scented gardens and charmingly pretty verandas. Or try La Quartier Francais, a small, charming boutique hotel part of Relais & Chateau that boasts five or eight course fine dining experiences, cosy classic movie screenings and aromatherapy treatments. Ride the Franschhoek Wine Tram for a wonderful hop-on-hop-off journey along the wine route to Paarl and back and experience 10 to 12 top wineries and restaurants en route whilst discovering the region’s history. To avoid disappointment, we can book this activity in advance for you during summer months. 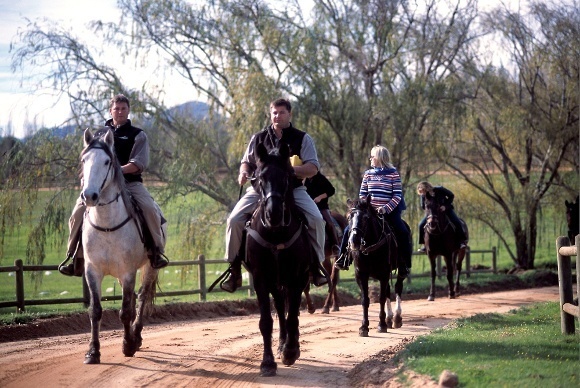 You can also enjoy a wine tasting on horseback at the town’s Paradise Stables for a truly unique experience! 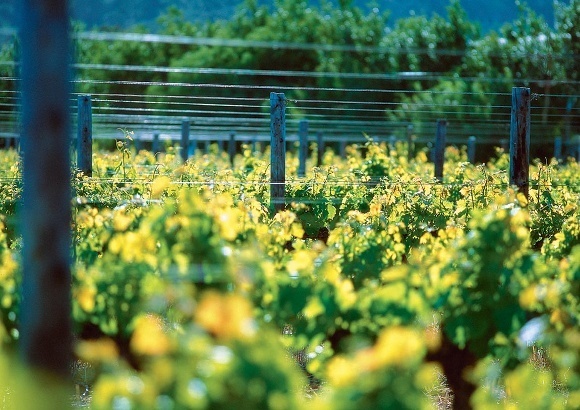 The Franschhoek Summer Wines Festival, which takes place at the end of March, and Franschhoek Uncorked which takes place in early September, are two annual highlights this year for sampling crisp glasses of wine from the region. 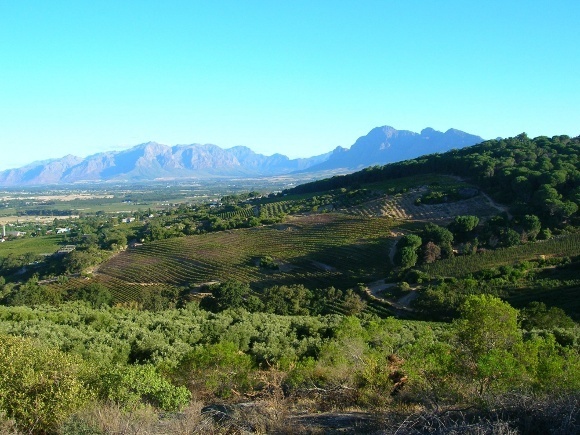 A town that housed Nelson Mandela for part of his imprisonment, Paarl is also a major fruit and wine producing region. 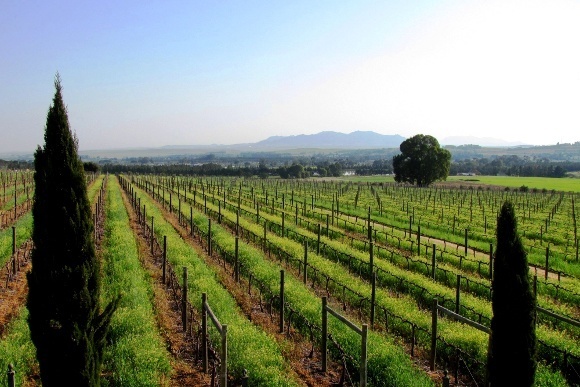 Paarl’s wine-making industry at one point had more international notoriety than Stellenbosch, housing the headquarters of the Co-operative Wine Growers’ Association (KWV). Grande Roche for a gracious, unhurried stay at the foot of the magnificently majestic Paarl Rock, which is frequently compared with Uluru or Ayer’s Rock in Australia. You can unwind in leisure in this biodiverse nature reserve alongside vineyards and a working fruit farm. A special, weather-permitting and unusual wine experience is found with a Viljoensdrift wine boat cruise in Robertson. Sail along the Breede River in open skies observing nature whilst nosing the crisp aromas of the local viticulture. You can even fill a picnic basket with items from the local deli for a culinary treat. In winter a cosy indoor fireplace adds to the ambience of the drifting riverboat. We all know that wine and cheese go well so we also recommend a visit to the Fairview Wine and Cheese Estate where you can sample the estate’s delicious hand-crafted goat’s milk cheese for the perfect aperitif. The Nederburg Wine Auction and Paarl Wine Festival, which plays host to some of the finest winemakers and sommeliers from across the world. This is a memorable and influential event that can boost a vintage or estate onto the leading global wine and winemaker lists! Did you know? 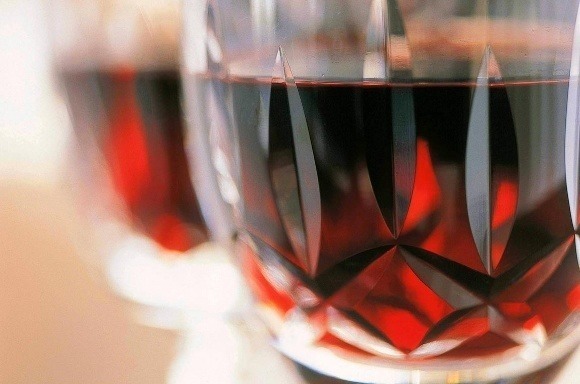 Enchanting Travels also offers exclusive sommelier experiences and winery stays in Argentina and Chile too! We’ll help your design the perfect South Africa travel plan for you.